I can only assume that the director is doing everything she can within her programming, to affirm my questions of the letter to the A.P.A. 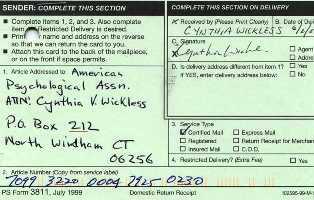 ATTN; President, Cynthia V. Wickless PhD. RE; Letter to A.PA. 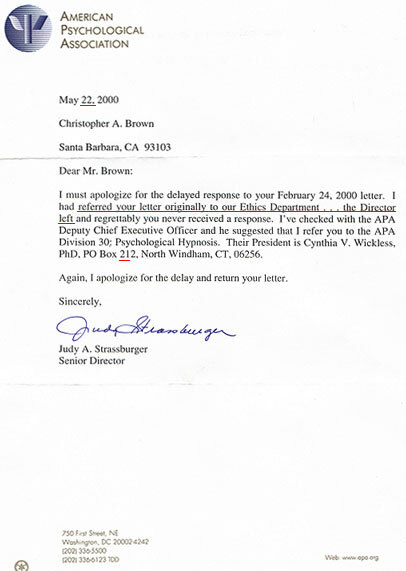 of 2/24/00, response from Judy A. Strassburger, Senior Director and reference to Division 30. Included with this letter are my original letter to the A. P.A. received 2/24/00 as well as the copied texts accompanying the letter. Also, attached to this letter, is the response letter from Senior Director Judy A. Strassburger. The second sentence of that letter is quite disturbing and implies that my original letter, referred to the Ethics Department, was recognized there as defining a MAJOR breach of ethics. The implication is derived from the information that the Director of the Department left. Based on that implication I convey to you that what is happening is not about blame, it is about understanding, protecting and healing lives. Protecting lives at this point can be best achieved with a condition perceived by the public. That condition is a media distributed, clinical, affirmative recognition of the potentials of questions; A., B., C., and D., of my original letter to the A.P.A. by the A.P.A.. Medically, the recommendations to the California State Department of Mental Health requested in the February letter will serve best to accommodate effective treatments and actual healing, further protecting human life. With regard to the import of the last sentence and the delay of response to the February letter to the A.P.A., I include a self addressed and stamped envelope to facilitate immediate confirmation of action or response to this letter, or by reference, the requests of the first letter. Please advise soon. Here is the response. Notice it does not come from the A.P.A. The A.P.A. unconsciously knows that the potential abuses of hypnosis, particularly somnambulism, include the behaviors that are epidemic in our society today. Instead of responding, the A.P.A. refers the matter to someone who is capable of passionate, irrational dissociation, in the hope I will be satisfied. My reactions to this letter details the noted, bracketed areas of the communication from Washington State University. 1. I had referred to "ABUSES" Barabasz distorts "minimizing" the issue. A cognitive distortion. 2. Ihad not asked if the person mentioned was a member of the A.P.A. I know they are not. 3. If the 30 year old paper is "out dated" what is the new reference comprehensive to my issues? Without that information this is a another cognitive distortion of "minimumization"
4. The source is Black Law Distionary, named and attached, is linked in my letter below. 5. 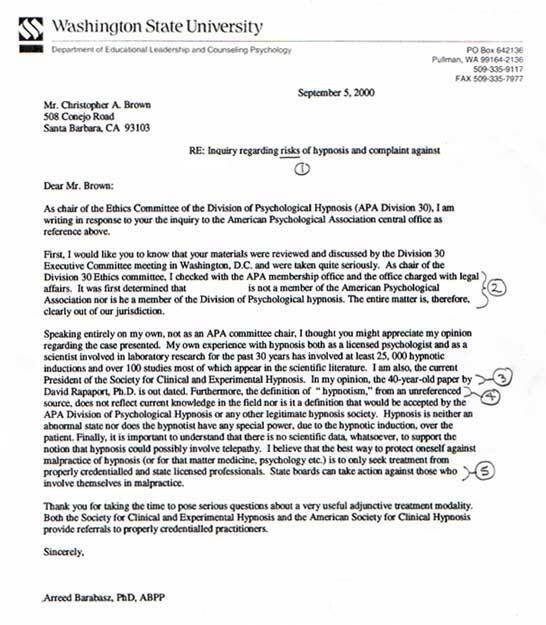 Barabasz does not know that it is absolutely legal to hypnotise a person wthout their awareness in California so licensure is not competent if it does not include investigation of abuses. ORIGINAL LETTER TO THE A.P.A. If Mr. Barabasz were fully rational the letter above would have actually responded to the issues and inquiry set forth in this letter. It does not even try. In fact the first thing it does is a "repressional" or dissociative reaction by diminishing the seriousness of what I present with the term "risk" in RE; instead of "abuses". The text included with the letter is linked to this version.